Hooray for salads! May is National Salad Month, and sure, the idea of a salad for dinner might not be the most exciting thing you have going on at the moment (especially when steaks exist), but if you want to think outside the box, you’ll laugh at others who think that salads are merely iceberg lettuce chunks and sad strips of carrot. A salad could be a great base for a culinary adventure, and I think you’re ready to take this journey, dear reader. Let’s talk about a few life-changing (or at the very least, meal-changing) salads that might change your mind about leafy greens. You can get the full recipe by clicking on the links listed below. Corn isn’t just for summertime barbecues – and doesn’t bacon make everything better? This salad includes a lot of bold tastes that’ll really wake up your taste buds. While grilling your corn will enhance the flavor, it’s not a mandatory step. While I like all of my greens equally, arugula is a nice choice that makes this salad stand out. This Greek-inspired dish is a healthy (and vegetarian) choice for a light dinner. It incorporates sun-dried tomatoes as well as a bunch of beans that’ll help power you through the night. The lemon zing at the end will definitely remind you that you’re eating a fresh dish. While spinach is a great go-to green, the recipe will also work well with loose-leaf lettuce or even watercress. If you feel like a cheeseburger, but feel the need to eat a salad, you’re in luck! 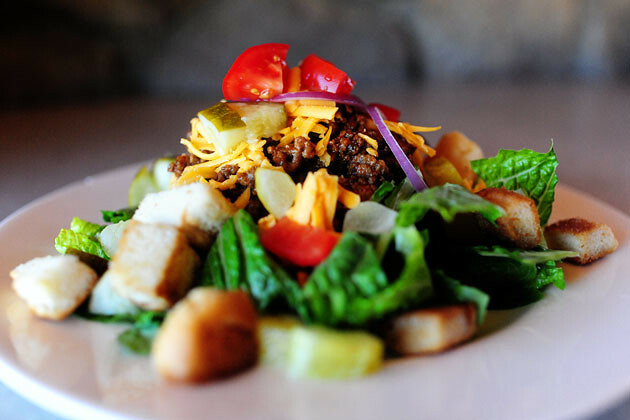 It’s the Cheeseburger Salad, courtesy of the crazy-talented Pioneer Woman. If it weren’t for her, I’d never know how to make iced coffee at home that didn’t include loose grinds and dirty looking water. The cheeseburger salad is pretty similar to a taco salad, and actually incorporates all of your favorite burger condiments within the cooking process. Genius. Since we just talked about the Cheeseburger Salad, it seems appropriate to mention the Pizza Salad. Not only is this a healthier way to tame your pizza cravings, but it’s a way to really give your head of iceberg a bunch of flavor. Bonus: This salad incorporates salami strips. While you might already have a strong opinion for or against kale, you should give this recipe a shot anyway. The amazing creator of this salad recommends letting the vinaigrette soak into the salad, since kale is a bit stronger than spinach or lettuce and will soak up the flavor without letting it wilt into a sad, saturated mess. It should be noted that freshly grated Parmesan will turn absolutely everything into a masterpiece. Seriously. Everything. Yeah, we’re all familiar with the Caesar Salad. It’s available at pretty much every restaurant, and it’s your fall-back plan if nothing else on the menu suits your fancy. There’s nothing wrong with Caesar Salad, but besides the addition of shrimp or chicken, there’s nothing you can do with it. Right? Wrong. Martha Stewart believes that hard-boiled eggs could be a welcomed addition. Martha’s recipe also calls for baguettes, which will help turn this salad into a full-blown awesome dinner. Sure, you might have certain opinions about Paula Deen. But no matter what she does in her personal life, she makes a heck of a great taco salad in her professional life. I’ll admit – I’ve been thinking about taco salads since name checking them earlier. They’re absolutely delicious, remind me of college, and worth mentioning on a list about salads. Paula’s recipe will only take you ten minutes and includes iceberg lettuce and tasty salsa. While you can use your own dressing, she believes Catalina will create the best taste. Are you inspired to make any of the salads listed above? If your favorite salad didn’t make the list, feel free to mention it in the comments!